The Weston Single Hamburger Press will allow you to create perfectly sized, pressed, and portioned burgers any time with your own ground meats! Making your burgers yourself also allows you to season them exactly to your preference! 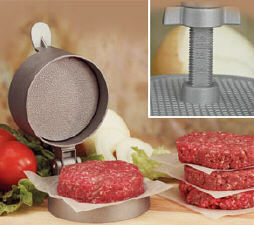 This hamburger press creates perfectly formed burgers while eliminating 'fat' burgers that are undercooked in the center, and 'thin' burgers that fall apart when you try and flip them. Creates a perfect, uniform patty every time. To Use: Place ground meat on a restaurant-grade paper sheet in the press. Put another sheet of paper on top, and press down firmly.